Blige says women have "suffered enough" in a male-dominated society. Music legend Mary J. Blige said the ongoing feud between artists Cardi B and Nicki Minaj is "negative" for women in a male-dominated industry. Blige spoke out for the first time about the industry trying to pit women like Cardi and Minaj against each other. She believes it reflects negatively on all parties involved and said women have "suffered enough" in a male-dominated society and business. Blige, the "Queen of Hip-Hop Soul," has been a powerful influence in the music industry since 1992. She opened up about seeing women treated horribly growing up, including her own mother. "As a kid I was like ... I don't ever want to see another woman hurt again," she said. Blige, who was abused by her former husband-manager Martin "Kendu" Isaacs, admitted to becoming the "battered woman" she vowed not to be. But she's come a long way since then. "In order to teach or inspire someone you have to become the thing, so they can see you come out of it," she said. "When you see us trying to do something," Blige said about women in the music industry, "at least try to bring us together. At least try to lift us up together and continue to lift each other up. Why can't Cardi win the Grammy? Why can't she have her moment?" More than anything, Blige is making sure women get what they deserve. She wants to see "women get what's equal to them. What they're supposed to get, and I'm a part of that." Cardi made Grammy history when she became the first solo female artist to win best rap album. "Invasion of Privacy" beat out male nominees Nipsey Hussle, Pusha T, Travis Scott and the late Mac Miller. 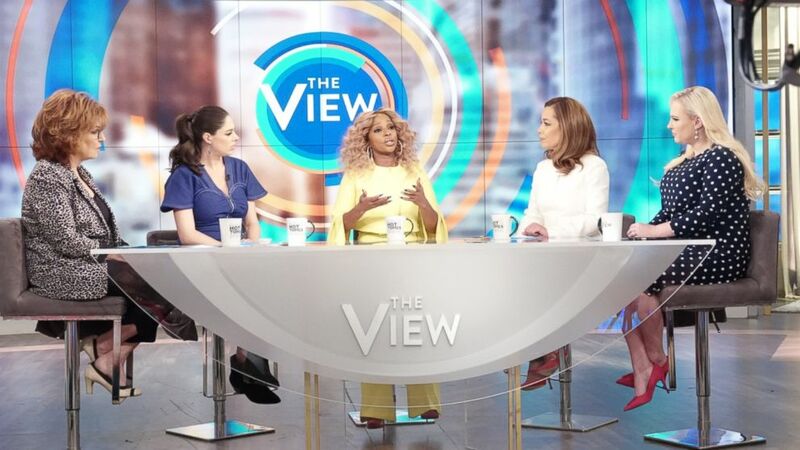 (Nicolette Cain/ABC) Mary J. Blige discusses discusses the impacts of pitting women against each other in the industry on "The View" Feb. 18, 2019. BET tweeted about the win, referencing Cardi's strained history with Minaj. Minaj decided to pull out of the BET Experience concert at L.A. Live, where she and Cardi were set to separately headline. "Young Money will no longer be apart [sic] of the BET Experience or award show," Minaj tweeted, also announcing that she will release her summer tour dates soon. Cardi spoke about the backlash she received in a series of now-deleted Instagram videos, reportedly alluding to BET's tweet. "That's not my style and that's not what I'm with," Cardi said. "It's not my style for people to put other people down to uplift somebody else." Tension between the New York City natives came to a head on their home turf during Fashion Week last fall when Cardi and Minaj reportedly got into a physical altercation at Harper's Bazaar Icons party. Since then, the two have vowed to keep things between them positive.